1. Many patients see dialysis as the end of their lives, what makes you feel so optimistic? Dialysis is the beginning of another journey, albeit a necessary one. It is not the end of one’s life. Yes, there are adjustments, there is a lot to learn, but I have seen people not only survive but thrive with dialysis. It requires a change in thinking, a need for social and family support; it requires time to get one’s head and heart around the idea of dialysis. My goal for each person is that they get to the point where their dialysis revolves around their life and not the other way around. 2. With many patients, they try to delay the need for dialysis and extend the life of their kidneys as long as possible. Often we can do just that, but maybe not forever. How do you know when it’s time to initiate dialysis treatments? 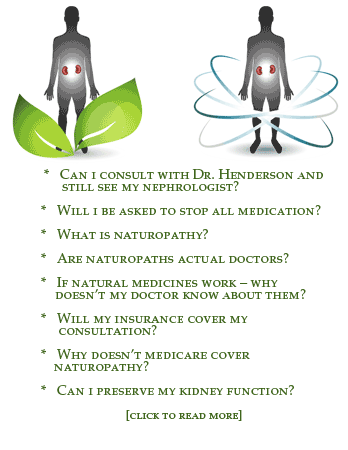 There are those symptoms that most health care providers will ask about those uremic symptoms when the kidney is no longer able to function as a filter to remove toxins from the body. These can include nausea, vomiting, food tasting like metal, uncontrollable itching and/or hiccups. Sometimes there can be big problems dealing with swelling and fluid buildup. Often the signs are subtle: fatigue, lack of an appetite, weakness, confusion, that just gets worse over time. This is why it is so important to have a close relationship with your health care provider who knows you and whom you know and trust. Sometimes it is the small subtleties that can make all of the difference. 3. There are some big differences in the approach to wellness for a kidney patient looking to preserve kidney function versus a dialysis patient looking to stay as healthy as possible. Limiting protein and drinking plenty of water is good for someone with chronic kidney disease, but a dialysis patient needs to limit water and increase protein. Are these often difficult adjustments to make? Yes. The dietary changes that those on dialysis need to adjust can be major. It can be different and overwhelming at first, but it is necessary to be able to adjust to over time. I think that we as healthcare providers can do more with nutrition than we are doing. It is not just about increasing protein intake, it is about trying to change your body chemistry, supplementing with the right amino acids…I think that muscle wasting (sarcopenia) on dialysis is an under-discussed topic among health professionals. They are just beginning to look at this most important area. 4. What is the biggest difference between the dialysis patients who are successful and those who aren’t? They have their minds and spirit wrapped around the idea that they are on dialysis and that they are on a journey they wish to be active participants in. There is one thing to be told that you are starting dialysis; accepting it and being able to move beyond the initial fear and apprehension is so important. The most successful dialysis patients are those that advocate for themselves, ask questions, and learn. 5. Have you seen some dramatic turnarounds in your patients when they implement some of the changes you recommend in your book? I have seen differences in how patients feel…the goal with some of the supplements is to build the body back up, providing nutritional and antioxidant support and reducing inflammation as much as possible. It can be a struggle taking so many supplements in addition to pills. That is why I try to promote certain protein based powders. 6. Many nephrologists are eager for their dialysis patients to move on to a transplant as quickly as possible, do you think transplantation is always better than dialysis? It is important for people to realize that in general dialysis is seen as a bridge to transplantation. That being said, it may not be for everybody. Having many chronic illnesses, especially heart problems may not enable someone to be a candidate for dialysis. I think that for those that are candidates for transplantation, I want to promote it as much as possible. 7. My personal preference was for in-center hemodialysis, yet other patients opt for peritoneal or home hemo. As a practitioner, is there one type of dialysis you’d prefer to see patients on? Home-based therapies allow for greater flexibility, and in general, patients often feel better. I say in general because home-based therapies are not for everyone. My job is to sit down with someone and review options. They then look at the pros and cons of each, and I try to help them make the best-educated decision for themselves that I can. 8. For many people losing their freedom once they go on dialysis is one of their biggest concerns. However, it’s easier than ever to make arrangements for dialysis traveling anywhere in the US. What are some of the biggest anxieties you see in kidney patients facing dialysis and are they able to cope once they’ve settled into the routine? With travel, many think they are not able to travel anymore. With in-center dialysis, you need to work with the social worker of the unit to make changes ahead of time. It is so important with dialysis that in your mind you accept it. By accept–I don’t mean passivity, I mean an acceptance and resolve to move forward. Not accepting means dialysis treatments that are missed, over time someone can get really sick. 9. If a dialysis patient is vigilant with their health, how close to normal can they expect to live their lives? I am going to reiterate what I said above: my goal for everyone, as much as possible, is to have dialysis revolve around their lives, not the reverse. Dialysis is such a dramatic change that it is not simply saying “you need to start dialysis.” Education, proper nutrition, the love and support of family and friends, social interaction, a good attitude is vital. When all of these factors are in place, their lives get better and their experience with dialysis markedly improves. Thank you, Dr. Snyder. Your wonderful information is very helpful for patients making this difficult transition to a new lifestyle. The book, What You Must Know about Dialysis: The Secrets to Surviving and Thriving on Dialysis, is available on Amazon.